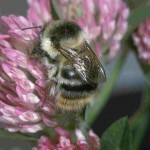 This is an information portal to help interested volunteers track the status of the Great yellow bumblebee and the Shrill carder bee and assist with their conservation. These pages will be further updated later in 2018. In good news both the Great yellow bumblebee (left) and the Shrill carder bee (right) are each being picked up on a small number of sites through the All-Ireland Bumblebee Monitoring Scheme. Long term monitoring of these species greatly helps in understanding how strong individual populations are. For Rare Species Watch we have chosen 5 locations for each species to focus on. These are locations where the species has been recorded post 1980, but for which we don’t have good recent data. For most of these locations we simply don’t know if the species still occurs there. The Great yellow bumblebee Bombus distinguendus is in severe decline in Ireland but we don’t have good data on it’s current distribution. 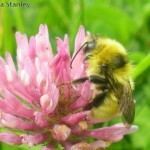 We know Bombus sylvarum has declined in Ireland but we don’t have a good handle on the current status of this species. The Burren currently represents the most important location for this species in Ireland and Britain.